A Chinese site MyDrivers.com has manged to get their hands on a AMD Bulldozer based Processor and already posted a few benchmarks. A whole set of details and benchmarks were leaked by Gigabyte a day ago which you can see here. The AMD Bulldozer based CPU is part of the Zambezi-FX based series which will be aimed towards desktop users. The CPU-z software reports that the chips is an engineering sample which the Chinese guys got their hands on. 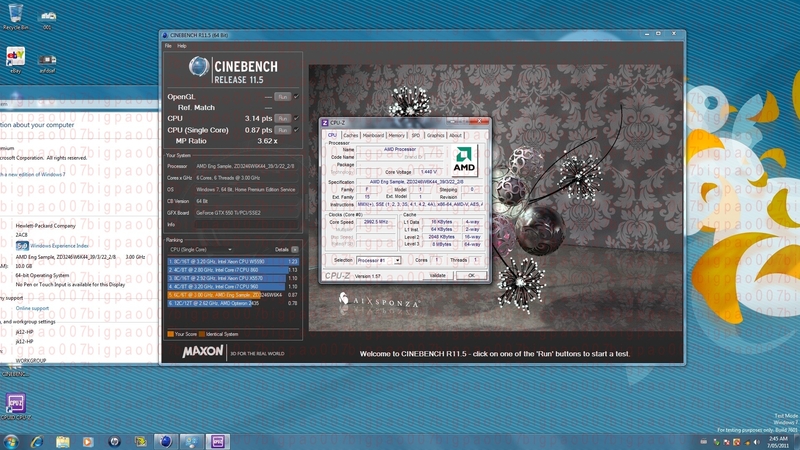 The chip runs at 3.0Ghz (2992mhz) while turbo-boost is unknown. The CPU comes with 8Mb L3 Cache and has 6 Cores and 6 Threads. The PC being used was equipped with 10Gigs of ram and ran on a 64-bit Windows 7 OS. Let’s move ahead to the benchmarks, Benchmarks included Fritz Chess Benchmark and CineBench Single/Multi Threaded benchmarks. The Fritz benchmark shows the CPU got a score of 7548 Node Count per second however no other comparison was made to check how much performance does the CPU offers over other processors. CineBench gives us some better details, The single threaded run reports that one lone core was a bit slower that i7 960 and i7 860 however Multi Threaded performance makes things even worse with the CPU lagging way behind the i7 860 while i7 970 is fastest of these three. The part where Bulldozer was meant to shine which are Multi-Threaded apps, It lags way behind then the Intel Competitors. One could blame the engineering sample for this kind of sluggish performance as the new Zambezi-FX CPU’s will be way more polished and refined versions of the samples being used here. Gigabyte Slide reveals AMD Bulldozer Launch Date, Will be launched on 7th June at Computex 2011.